Why won't my Azurill evolve? So I rejected her evolution (on accident one time) and now she is at level 33 with max affection and still not evolving. I know it has nothing to deal with Pokemon Amie and everything to deal with other factors. I took her to the lady and she tells me Azurill couldn't be happier, but it still won't evolve. any chance you have an everstone on it? Please be exact with what the friendship rater said, and also tell us what version this is. That's because Azurill doesn't evolve from max affection, it evolves from high friendship! >Azurill evolves into Marill when leveled up with high friendship, which evolves into Azumarill starting at level 18. Affection and Friendship are completely different things. >In Generation VI, friendship is not to be confused with Pokémon-Amie's affection. Affection is an entirely separate stat having no bearing on friendship, and no actions taken in Pokémon-Amie will affect friendship in any way. † These include Pomeg Berry, Kelpsy Berry, Qualot Berry, Hondew Berry, Grepa Berry, and Tamato Berry. Azurill will need to have a friendship value of at least 220 or higher for it to be able to evolve into a Marill. Once it has a friendship value of at least 220 or higher, you have to level it up one level and it should evolve into a Marill. He said he knows that affection has nothing to do with it, but I suspect the Azurill's friendship isn't high enough. Yeah same, I don't think his Azurill's friendship is high enough either. He doesn't actually mention friendship though, just affection and Pokémon Amie, which lead me to suspect that he got affection and friendship mixed up with each other. That still doesn't explain why it tried to evolve once before, though. Azurill must of had a high enough friendship value to cause it to evolve when levelled up at one point prior to it being level 33. 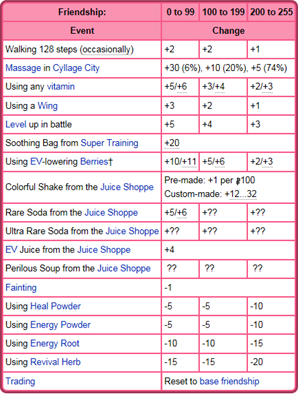 But since then it's friendship value must of decreased or reset from it either being traded, fainting consecutive times in battle, or from using a Heal Powder, Energy Powder, Energy Root or Revival Herb on it. Honestly there's no other explanation, other than Azurill's friendship value isn't at a high enough value or he hasn't levelled Azurill up once it's friendship value has exceeded 220. Why won't my event Rockruff evolve to Dusk Form? Why won't my Kadabra evolve when I trade it?